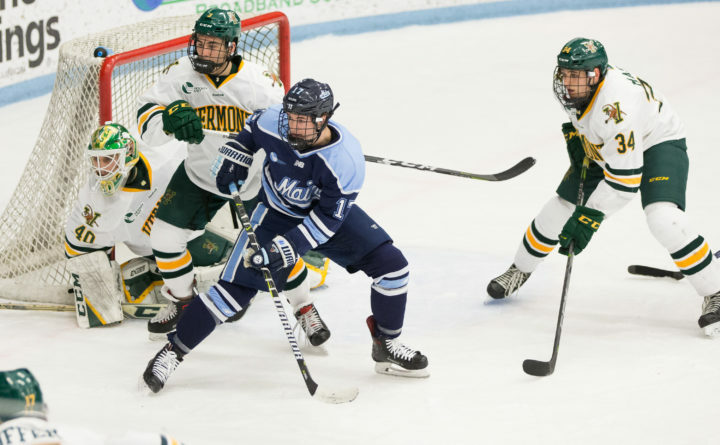 Tim Doherty of the University of Maine (center), pictured during a December 2017 game against Vermont, ranks second on the team with seven goals. Game notes: UNH is coming off back-to-back wins over Boston College (6-4) and Merrimack (5-0) and is 6-1-1 in its last eight games. Robinson made 25 saves against Merrimack on Friday to earn his second shutout. UMaine rebounded from two home losses against Northeastern with a 7-2 win at Boston College on Wednesday featuring goals from seven different players. UNH returned five of its top six point producers and is quick and a good transition team. UMaine must manage the puck well and get it in deep so it can use its size and strength to grind the Wildcats on the forecheck. UNH plays on an Olympic ice sheet that is 15 feet wider than Alfond Arena. UMaine swept the Wildcats in Orono in their best-of-three first-round series a year ago. UNH is 11th in the country on the power play (21.9 percent) and 12th on the penalty kill (85.3 percent) and has allowed only three power-play goals over the last 35 chances with three short-handed goals.